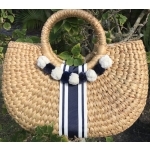 Our handmade, straw basket purses and totes are decorated in the USA. We accentuate their simple natural beauty with monograms, ribbons, and accessories to create an unusual and chic handbag for each client. We offer many combinations for you to choose from and many of our bags are one of a kind. 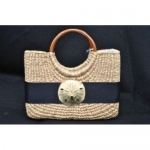 You have the choice of four different sizes of straw basket handbags and shoulder bags. Choose the color combination of your liking for a monogram bag or solid color ribbon with one of our beautiful beach castings. If you're a 'BOW' girl then we also offer handmade straw baskets with simple, top quality, 2" wide grosgrain ribbon bows. Our bows come in many colors and the baskets can be used as a handbag or a gift basket. We love them at Easter or to carry our wine bottles as a great 'thank you' for dinner!